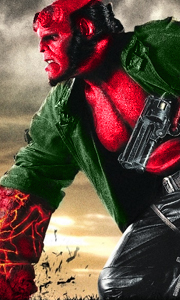 Own Hellboy Animated - Blood And Iron DVD from Deff, DVD, Blu-Ray & 4K Video Specialists - Free UK Delivery..
As dark forces gather to hasten the Apocalypse, Hellboy fights fire with fire in this mind-blasting supernatural action-adventure from visionary director Guillermo Del Toro (Blade 2, Pan’s Labyrinth). Based on the celebrated “Dark Horse” comic book.Blu-ray Special Features* • Audio Commentary with Director Guillermo Del Toro • “Hellboy: The Seeds of Creation” Documentary • VFX How-Tos • Deleted Scenes with Optional Director’s Commenta..
As dark forces gather to hasten the Apocalypse, Hellboy fights fire with fire in this mind-blasting supernatural action-adventure from visionary director Guillermo Del Toro (Blade 2, Pan's Labyrinth). Based on the celebrated "Dark Horse" comic book.Special Features Video Introduction by Director, 4 Short Films, 8 Set Visit Featurettes, 8 Branching DVD Comics, Commentary by director Guilermo Del Toro, Cast Commentary.. The fate of mankind hangs in the balance when a ruthless prince awakens an unstoppable army of creatures and wages war with the human world. It's up to Hellboy and his team of paranormal outcasts to face off with the forces of darkness in the ultimate battle of good versus evil! From the visionary director of Pan's Labyrinth, Hellboy II: The Golden Army takes you into fantastical worlds with imaginative creatures and thrilling fight seq..
As dark forces gather to hasten the Apocalypse, Hellboy fights fire with fire in this mind-blasting supernatural action-adventure from visionary director Guillermo Del Toro (Blade 2, Pan’s Labyrinth). Based on the celebrated “Dark Horse” comic book.DVD Special Features • Video Introduction by Director • 4 Short Films: ‘From the Den: Hellboy Recommends’ • 8 Set Visit Featurettes • 8 Branching DVD Comics • Commentary by Director Guiller..